Well I spent today trying to get rid of the leftovers from my chicken dinner on Saturday night. 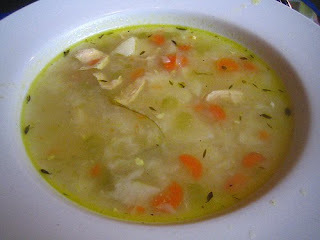 I went for the chicken soup option, as it is an easy dish and a nice winter warmer. Here’s today’s recipe. Put the carcass in a large pan, add water and boil for as long as possible, this makes the base stock for your soup. Chop the veg into nice chunk rustic size chunks, and fry the onion and garlic in another large pan. Add the other veg (apart from the broccoli) and then ladle in the chicken stock in until the veg are covered. Collect any remaining stock in a jug. Take the carcass and pic the remaining chicken off, placing it in the soup with the rest of the chicken stock. Simmer until the veg is ready, then place the broccoli in the soup, which will be ready to serve in 10 minutes. Serve with chunky bread, and season to taste. A great winter warmer, and awesome way to re-use the left over chicken. Next Next post: Christmas Spirit – No More for me!